Flin Flon's Whitney Forum is home to a number of banners. 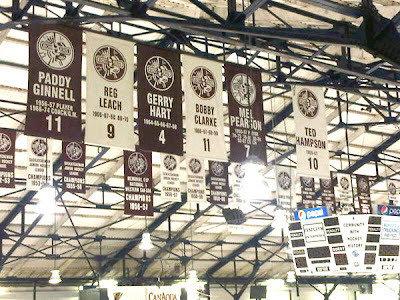 With the Moose Jaw Civic Centre (aka the Crushed Can) having lost a battle with the wrecking ball, it would seem that Flin Flon’s Whitney Forum is the undisputed heavyweight champion of arenas. Of course, one of these two gents may be a little biased, seeing as his father played goal for the Flin Flon Bombers back in the day. LOL! No matter! We have a photo that was sent along by @boxcullen, and, oh boy, the memories . . .
D Roman Teslyuk (Kamloops, Tri-City, 2003-07) signed a one-year contract with Arlan Kokshetau (Kazakhstan, Kazakhstan Vyschaya Liga). He had 10 goals and 17 assists in 48 games with Beibarys Atyrau (Kazakhstan, Kazakhstan Vyschaya Liga) last season. Let the debate begin . . . In Regina, the Pats dropped F Tanner Olstad, 20, who had nine points in 63 games last season. 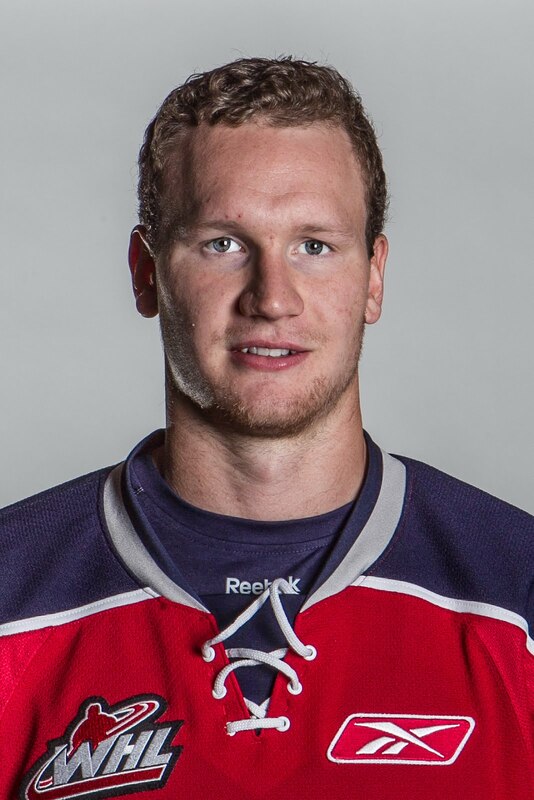 The Pats acquired Olstad from the Tri-City Americans during the 2010-11 season. In 39 games in Regina that season, he had 16 points. From Calgary, his junior A rights belong to the AJHL’s Okotoks Oilers. Later in the day, Pats head coach Pat Conacher told Greg Harder of the Regina Leader-Post he would like to see the WHL increase its 20-year-old limit. acquired by the Americans from the Lethbridge Hurricanes last season. He had 12 points in 71 games last season, putting up 10 of those points in 60 games with the Americans. In his career, he has 40 points and 293 penalty minutes in 227 regular-season games. . . . The move leaves the Tigers with three 20-year-olds, the others being F Kale Kessy and D Alex Theriau. Theriau is expected to be out until sometime in October as he rehabs from hip surgery. . . . The Americans are down to four 20s — F Justin Feser, F Jordan Messier, F Jesse Mychan and D Drydn Dow. F Patrick Holland also is in camp with the Americans, but has signed with the NHL’s Montreal Canadiens. If there is an NHL lockout, he will go to camp with the AHL’s Hamilton Bulldogs later this month. Mark Lamb, the GM and head coach of the Swift Current Broncos, has a brand new three-year contract extension in his back pocket. Shawn Mullin, the Broncos’ radio voice, reports that Lamb had one year left on his original deal; this deal erases the last year of that contract, so it runs through 2014-15. . . . Lamb has been with the Broncos since July 2009. The Vancouver Giants have dealt F Logan Harland, 17, to the Saskatoon Blades for a conditional seventh-round 2014 bantam draft pick and future considerations. Harland, who is from Paradise Hill, Sask., had a goal in 10 games with the Giants last season. . . . Vancouver F Anthony Ast has been suspended for four games and will miss his team’s regular-season opener. Ast took a check-to-the-head major and game misconduct for a hit on F Chase Souto in a game against the Blazers in Kamloops on Wednesday. Souto left the game and didn’t return as a precaution. He wasn’t injured. . . . The Prince George Cougars released D Linden Springer, 18, who is from Lloydminster, Alta., and now is with the AJHL’s Lloydminster Bobcats. Springer had six points and 89 penalty minutes in 56 games with the Cougars last season. . . . D Jordan Harris, the 10th overall pick in the 2011 bantam draft, has returned home to Prince Albert from the Cougars’ camp. He will play for the midget AAA Mintos or with a junior A club. . . . The Cougars also have returned D Sam Ruopp, 16, to the midget AAA Regina Pat Canadians. He was a fourth-round pick in the 2011 bantam draft. Yes, he is the younger brother of Prince Albert D Harrison Ruopp. . . . The Everett Silvertips have released F Tre Potskin, 17, who is returning home to Prince George where he will play for the major midget Cariboo Cougars. . . . Everett also assigned F Luke Gordon, 18, to the BCHL’s Nanaimo Clippers. He has played three WHL games with the Calgary Hitmen over the last two seasons. He spent most of last season with the Clippers. . . . The Regina Pats assigned F Dane Schioler to the midget AAA Winnipeg Thrashers. Schioler, 16, was a second-round selection in the 2011 bantam draft. . . . The Kootenay Ice has its roster down to 28 players after having assigned F Kurt Johnas, 18, to the MJHL’s Steinbach Pistons. The Ice is carrying two goaltenders, nine defencemen and 17 forwards. . . . The Saskatoon Blades have added F Luke McColgan, 17, to their roster. He is the younger brother of Saskatoon F Shane McColgan, who was acquired over the summer from the Kelowna Rockets. Luke actually was in camp with the Rockets for a bit, although he didn’t play in any exhibition games. Luke, from Manhattan Beach, Calif., played for the L.A. Kings U-18 team last season. . . .
F Jake Trask (Kamloops, Saskatoon, 2008-12) has signed with the ECHL’s Toledo Walleye. Trask, from Saskatoon, had 59 points, including 23 goals, in 62 games with the Blades last season. . . .
James Shewaga of the Brandon Sun reports that D Ryley Miller (flu) is back on the ice with the Wheat Kings after being sidelined for a lot of last week. F Dominick Favreau (back) and F Jens Meilleur (back) have been clearned to to return, while F Jayce Hawryluk (concussion) remains out. . . . The defending-champion Edmonton Oil Kings are being touted in most corners as a favourite to repeat. Their lineup is awfully deep and full of returning players, which will be at least part of the reason that three 16-year-olds were assigned from their camp on Monday. F Brandon Ralph, F Mitchell Walter and D Aaron Irving all are on the move. Ralph is returning to the midget AAA Fort Saskatchewan, Alta., Rangers, while Walter is headed to the midget AAA team in Spruce Grove, Alta. . . . Irving, the ninth overall selection in the 2011 bantam draft, is to play for the AJHL’s Bonnyville Pontiacs. . . . Evan Daum of the Edmonton Journal reports that Oil Kings D Martin Gernat (upper body) and D Dylan Wruck (shoulder) have been slowed. Wruck had off-season surgery and is awaiting medical clearance. . . . The Oil Kings are carrying 26 players, including two goaltenders and 15 forwards. Of that number, 20 were part of last season’s championship team. . . . The Lethbridge Hurricanes got down to 26 players by trimming a pair of 16-year-olds from their roster. F Carter Amson will play midget AAA in Saskatoon, while D Bryton Sayers is to join the midget AAA Prince Albert Mintos. . . . Both were second-round picks in the 2011 bantam draft. . . . The Hurricanes are carrying three goaltenders, eight defencemen and 15 forwards. . . . The Spokane Chiefs have assigned F Nakeh Lamothe to the AJHL’s Drumheller Dragons. Lamothe, 17, was a fourth-round pick in the 2010 bantam draft. . . . The Chiefs are down to 28 players, including three goaltenders and nine defenceman. They have 19 veterans still in camp.